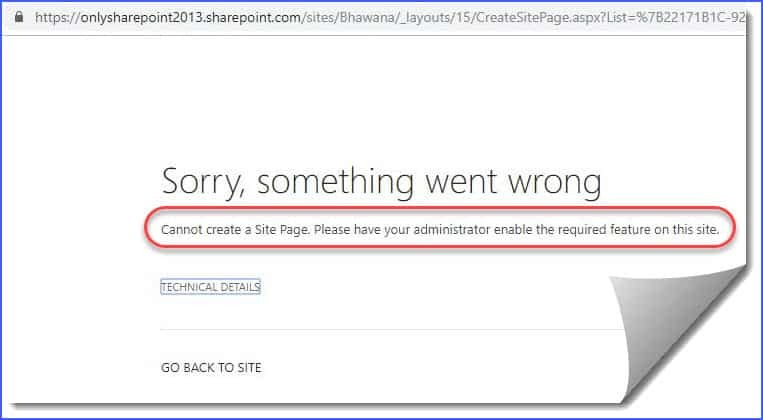 This SharePoint online tutorial explains how to solve an error: Cannot create a site page. please have your administrator enable the required feature on this site. The error comes while trying to create a site page in SharePoint Online. Recently, I was trying to create a site page in SharePoint Online site. But it gave an error as Cannot create a site page. please have your administrator enable the required feature on this site. The error was coming because “Site Pages” feature is not activated in the SharePoint Online site. Open SharePoint Online site, then click on Gear icon -> Site Settings. Then in the Site Settings page, click on “Manage site features” which is under “Site Actions“. Hope this article will help you to resolve Cannot create a site page. please have your administrator enable the required feature on this site error in SharePoint Online Office 365. Previous Article How to manually Trust SharePoint Add-in developed by visual studio SharePoint online? Next Article How copy items from one list to another list using csom .Net managed object model code in SharePoint online?